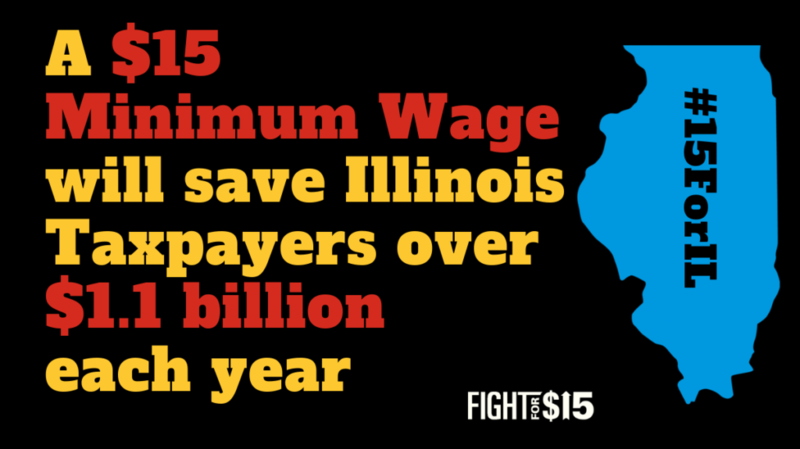 On February 14th, SB 1, the $15 minimum wage bill was signed into law in Illinois. “Our 50,000 home healthcare workers allow seniors to live independently and allow people with disabilities to live in their homes. These services save millions of tax dollars and improve the quality of life for the person receiving the care. Yet, far too many of these workers barely make $12 an hour. Not a day goes by that we don’t hear stories about a child care or even a hospital worker who has to make difficult choices about whether to buy medicine or buy milk and cereal so their children can have breakfast. 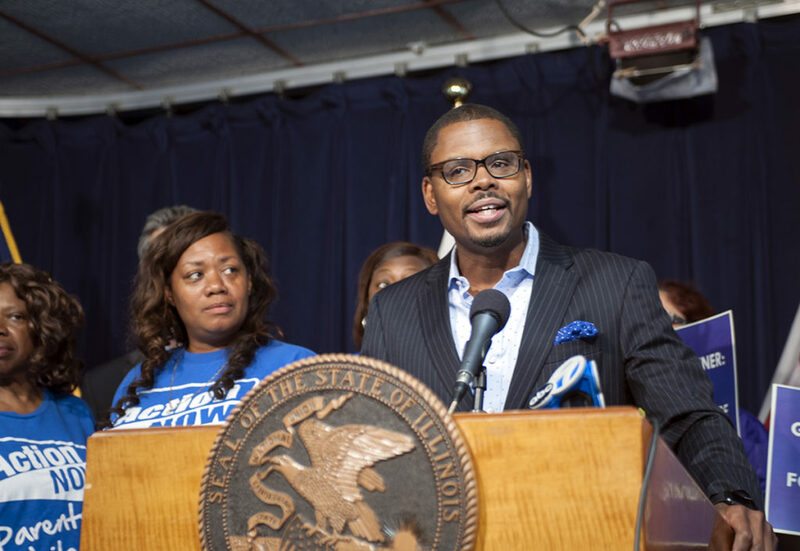 With the passage of SB1, IL became the first state in the Midwest to pass a $15 minimum wage. Download a fact sheet from the Illinois EEPI on the $15 minimum wage. 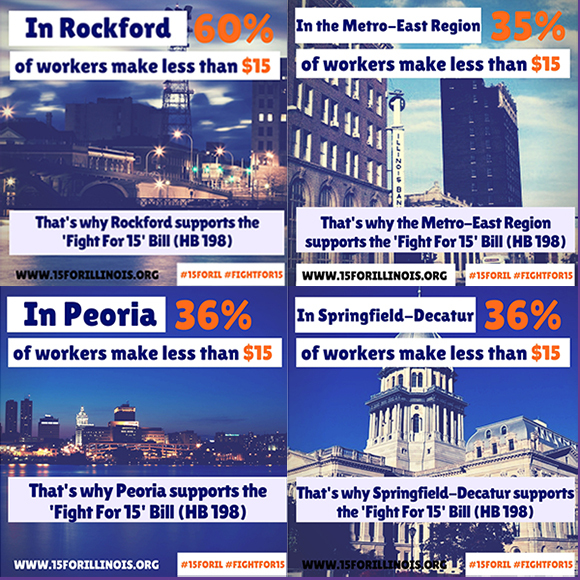 Every region in Illinois needs a $15 minimum. See pages 6-7 of this report for more details. Workers with children need even more than $15 an hour – even in the state’s lowest cost regions. 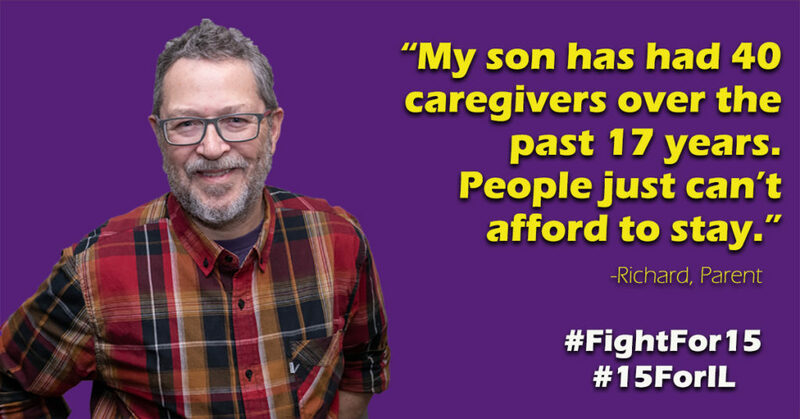 For example, in Rock Island – the lowest cost part of Illinois – for a two-worker family with two kids, by 2022 each parent will need to earn at least $18.97 an hour to afford a cheap apartment and cover simple living costs. 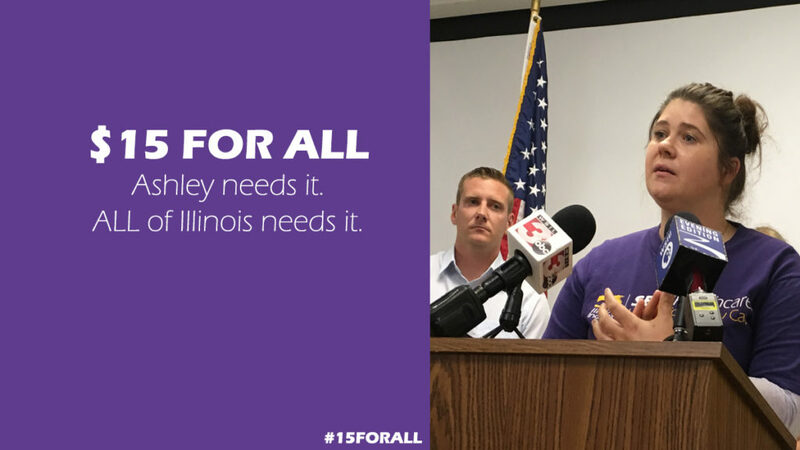 –Even in low-cost regions of the state, like Danville, East St. Louis and rural Illinois, workers will soon need $15 an hour or more just to cover the basics. For example, by 2022 – the date by which the legislature is proposing to raise the Illinois minimum wage to $15 – a single worker in rural Illinois will need to earn $32,178 a year just to cover housing, food, transportation and other basic costs, according to the Economic Policy Institute’s family budget calculator. This translates to $15.47 an hour for a full-time worker. Similarly, in Danville and East St. Louis, a single worker will need to earn about $15.55 an hour by 2022 to meet basic living costs. 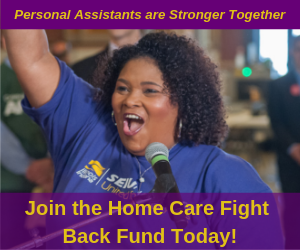 SEIU member & DORS home care personal assistant Iaesha Cross works three jobs, but it’s not enough. 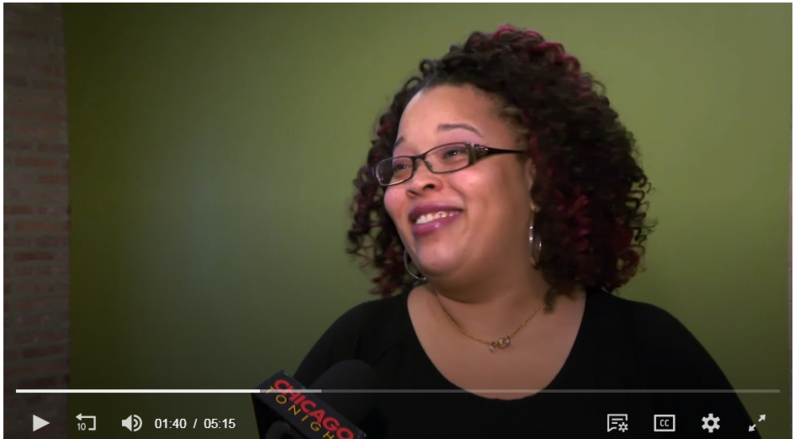 Her small paychecks go to her sister, who is a Chicagoan with a disability. She spoke to Chicago Tonight. Check out the video below. When we pass #Fightfor15, mothers like Liz of Homer won’t have to stay up for 24 hours straight, working three jobs and can spend more quality time with their families instead. When we pass #15forAll, Gail from Springfield won’t have to choose between the grocery bill, light bill, and the gas bill. 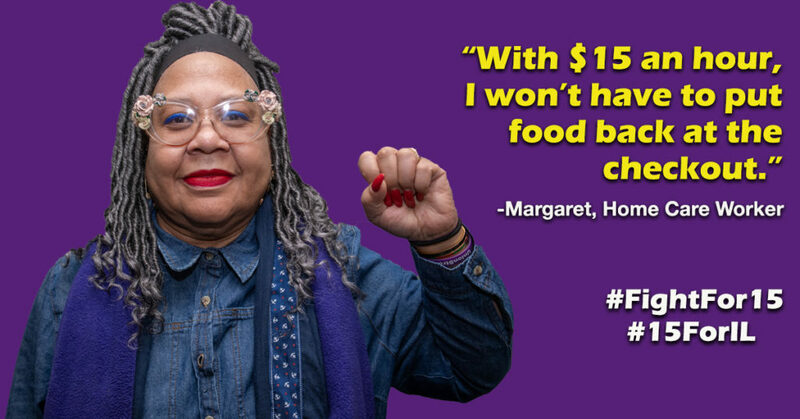 When we pass a $15 minimum wage, caregivers like Tanya from Harvey won’t suffer months without electricity. When we pass $15, hospital workers like Tichina can afford to put her daughter in a quality early learning program. 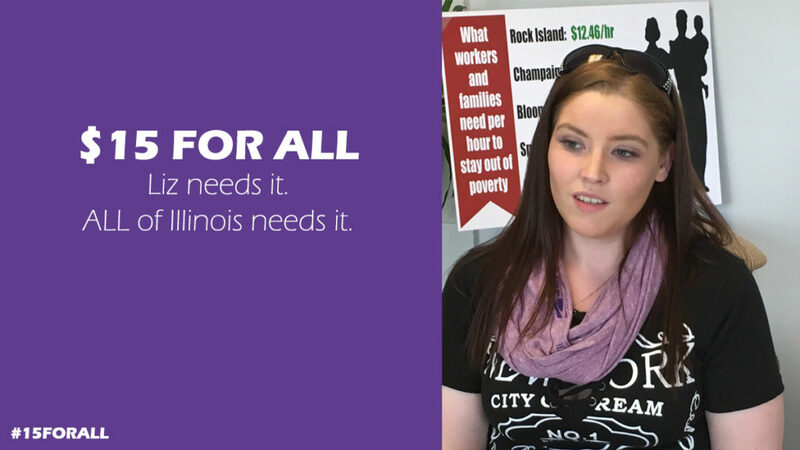 When we pass $15 in Illinois, early childhood teachers like Nicole Young will earn a living wage. “I have a bachelor’s degree in psychology. Administrators want us to go to school but they don’t pay us enough for the credentials we have. Despite the important work that we do — caring for children while their parents work — and despite the increased cost for parents, our wages have stagnated. A study from the University of Illinois showed that when Chicago raised it’s minimum wage, job growth was the same as in places in the suburbs that didn’t raise the wage. 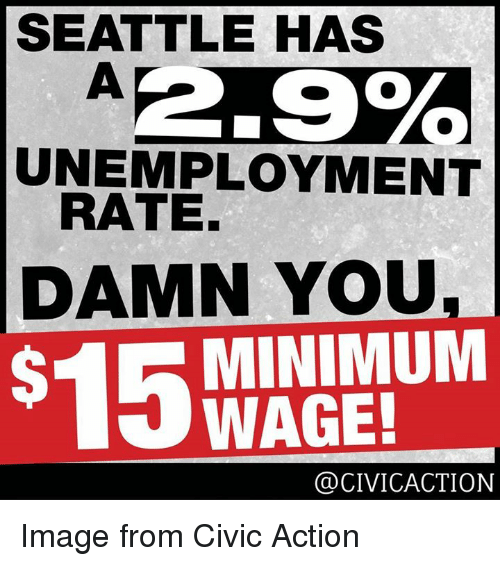 A study from the University of California at Berkeley looked at minimum wage increases in six cities, including Seattle, which is raising it’s minimum wage to $15. The study found the workers’ paychecks were boosted while not harming jobs. Workers aren’t the only ones speaking out for a $15 minimum wage in Illinois — so are small business owners. 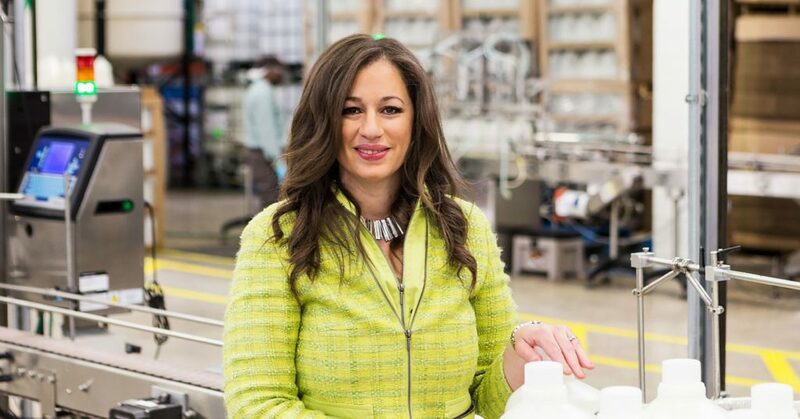 Kelly Vlahakis-Hanks, CEO of Addison’s Earth Friendly Products, pays her workers at least $17 an hour. Since raising the pay rate, turnover in the 300-worker firm has been cut in half. David Borris, owner of Hel’s Kitchen Catering in Northbrook, supports a $15 minimum wage in part because it increases demand in the economy. Why Should the Public Subsidize Big Businesses That Pay Low Wages? Allowing servers to be paid less encourages sexual harassment. 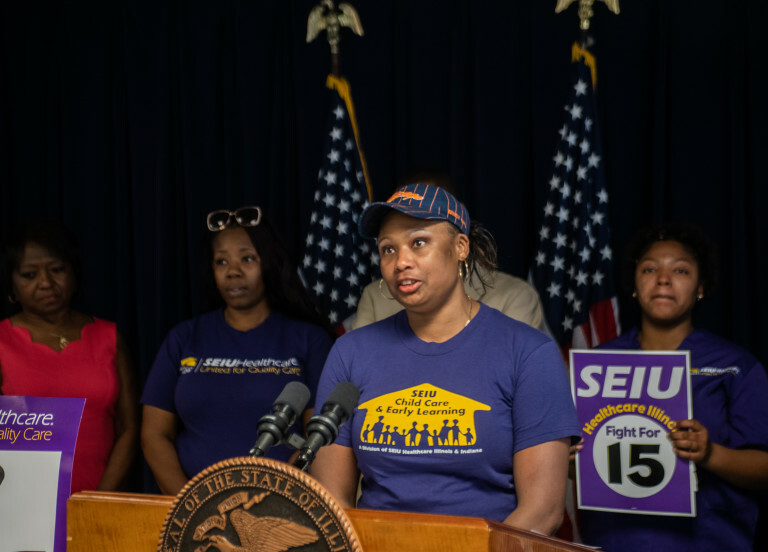 Illinois Democrats want a $15 minimum wage. These are the options on the table.